Air Optix Aqua lenses are made from a silicone-hydrogel material and are produced by Alcon. They feature a high level of permeability, which allows for occasional overnight wear if approved by your optician. This package also contains one 360 ml bottle of Gelone solution and a contact lens case. 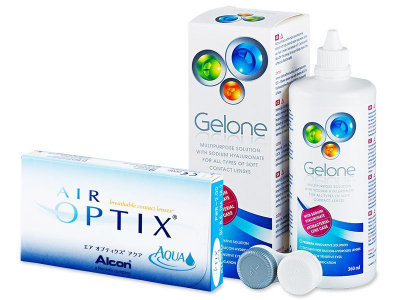 Air Optix Aqua are monthly contact lenses by Alcon designed for daily wear. The silicone hydrogel material of these lenses provides an exceptionally high level of oxygen permeability, allowing for occasional overnight wear. Overnight wear should always be approved by your optician first. Each package contains six lenses. 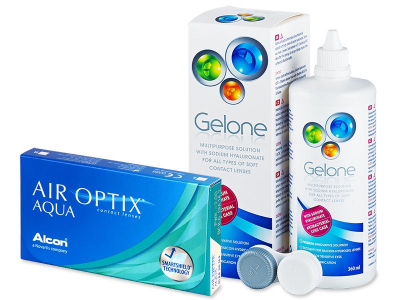 Gelone is a multipurpose solution for cleaning and storing all types of soft contact lenses. Thanks to its unique composition, which was created by combining hyaluronic acid and disinfecting ingredients, this solution is ideal for users with sensitive eyes. The cleaning components of the solution, along with the included antibacterial case with ionisation finish, create a perfect environment for disinfection. Sodium hyaluronate provides flexibility, softness, and moisture for contact lenses and wearers.